May, 2015 | H&R Group K.K. If Kyoto’s Gion festival is the biggest of the summer festivals, the Owari Tsushima Tenno Matsuri in Aichi is perhaps the most spectacular thanks to its beacon of shining lights floating down the Tenno river. What is the Tsushima Tenno Festival? 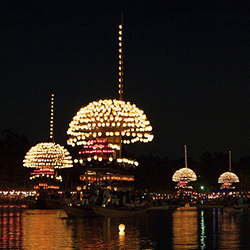 For 500 years people have been braving Aichi’s mid-summer humidity and flocking to the banks of the Tennogawa to see this glorious summer spectacle, the highlight of which is the sight of five brilliantly illuminated ‘makiwara-bune’ boats gliding through the gently undulating water. Designated as one of the National Important Intangible Folk Cultural Assets in 1981, it takes place on the fourth Saturday and Sunday of July. The festival begins on Saturday 10:00 when the portable Mikoshi shrines are moved from Tennogawa Park to Tsushima Shrine, and people will begin to gather throughout the day, staking their claims on the river banks, eating and drinking from the yatai food stalls. However it does not begin in earnest until early evening with the ‘yoi-matsuri’, or night festival. At around 18:00 there are demonstrations of matchlock weapons, shamisen (a Japanese string instrument kind of like a banjo) as well as other traditional Japanese arts and music. At 19:00 teams begin to light lanterns that are attached to the boats and amidst a fireworks display the boats set sail down the river, floating serenely towards the Tennogawa park, before returning. This is the highlight of the festival, and for many people, of the whole summer. The next day is the asa-matsuri, the morning festival, where six boats this time (the five from yoi-matsuri and the “Ichieguruma” boat from nearby Higashiho-cho) sail from 9am. The boats are redecorated with black and gold handmade tapestries, and atop each boat are okimono dolls in Noh performing arts costumes, and bands playing traditional music. Upon arrival around 45 minutes later men carrying halberds made of cloth dive one by one from the Ichieguruma into the water, swimming or walking to shore. Then each boat’s ‘chigo’, a sort of semi-deified mascot child, dismounts from the boat and after the boats have returned they perform kagura music at 11:30. While there is agreement that the festival began around 500 years ago, there are conflicting opinions on how it first came about. Some say it is simply a Shinto ritual, others say it is to honour the deity Gozu Tenno and some say it is a festival based on Kami-mukae, a welcoming of the gods in the hope of avoiding the various diseases that abound in the hot muggy summer. Another story still tells that it comes from the Nambokucho period (1336-1392) when the rival Northern and Southern Imperial courts of Kyoto and Yoshino respectively were battling for supremacy. The story goes that Prince Ryou, the grandson of Southern emperor Go-Daigo, had escaped to Tsushima, and the local warriors subdued his Northern pursuers by a boating invitation on the Tenno river. Whatever the truth, the Tsushima festival has a long and illustrious history, and it was believed to be a particular favorite of the great warlords Oda Nobunaga and Toyotomi Hideyoshi, so much so that the latter considered replicating the festival near his Fushimi Castle in Kyoto. The most remarkable part of the festival is of course the five makiwara-bune boats that represent the five villages that made up Tsushima. They are of quite remarkable design, particularly for the yoi-matsuri. The floats are made from two boats lashed together by purified ropes and built up to represent a mountain (though looks more like a brilliantly glowing mushroom cap). Around the central passenger carrier level hang thirty red lanterns called ‘miyoshi-nagashi’ to represent the days of the month. Above that is the ‘nabezuru’ where are placed 365 lanterns in a dome shape to represent the days of the year, and on top of all this is a pole lit by 12-13 lanterns for the months (the 13th is for leap years). It is this cacophony of light, combined with the explosions of fireworks overhead, that really makes this festival something not to be missed. There is really no way to convey the adrenaline fueled excitement of Red Bull Air Races through text, you just have to see it. In the nine years since the event took off, the event has only become faster and more exhilarating as the organizers strive to achieve the most advanced aerial challenge the world had ever seen, every time. The high speed, low altitude and extreme maneuverability required rules out any participant outside the world’s most exceptional pilots. Fortunately, there are no such restrictions on becoming a spectator. Park opens at 10, races begin at 1. Tickets start at JPY 10,000. Many people are not aware of it, but Curry House CoCo Ichibanya, or just CoCo Ichiban as it is often called, has something in common with the game pachinko. Both are native to the Chubu Region of Japan (Nagoya City and surrounding region). The first CoCo Ichiban was opened in Nishi-Biwajima on the outskirts of Nagoya City in 1978. Not long after that, the corporate headquarters was established in its current location in Ichinomiya City, also outside of Nagoya. Offering good, cheap food grew CoCo Ichiban from that first location to over 1,000 branches worldwide. While most locations are within Japan, some 100 are spread throughout Hawaii, China, Taiwan, South Korea, Thailand, and Hong Kong. Their first overseas location was opened in Oahu, Hawaii in 1994. The CoCo brand has recently grown to include other types of restruant, including “Pasta de CoCo,” specializing in ankake spaghetti (spaghetti dressed with liquid starch), Opened “Menya CoCo Ichi,” specializing in curry udon, “Kayusaryo Kassai” specializing in rice porridge, and “Nikkui Tei,” specializing in Hamburger steak, but none can compare to the popularity of the original brand. The cool part about Coco is that you can pretty much get your curry anyway you like it-assuming you can impress upon the person taking your order what you want, that is. Barring any skill in Japanese, pantomime, or mentalist abilities, the menu has plenty of pictures at which you can gesture. The important things to remember when ordering is that you choose the picture of what you want-say the chicken katsu and vegetables curry first, and then you must choose your level of spice and rice size. Choosing the spice means choosing either sweet, regular, or a level between 1 and 10. I realize that you may really like spicy food, but I caution you not to jump right into 10; mostly because it tastes like burning, and that is about it. I love spicy food, and I tried it once. I ate it, but I stick to 3 or 4 now. The thing to keep in mind about spice is that the guy throwing the ingredients in is making minimum wage, and there can be a pretty big difference between 3 for dinner on Wednesday, and 3 for lunch on Thursday, and yes, I do occasionally eat it that often! The rice is measured in grams. 300 is standard. I am a pretty big guy, and you can tell from looking at me I like to eat, but 300g does me just fine. You can get anywhere from 100g to 600g. I have seen people eating the 600g portion, and frankly, it is a little frightening. Scarily enough, there is a notation on the menu that larger sizes are available upon request, but I cannot imagine the size of bowl they would have to use. In addition to those basics, an advanced order could include multiple menu items both large and small. Extra vegetables, another katsu, cheese, natto, corn, garlic, scrambled eggs, bacon, or kimchi are all available for your dining pleasure. I myself like to stick to a nice simple order of a mince meat croquette, spinach, 300g of rice and level 3 of spice. I should probably vary that, but I do not like change. There are also a range of additions available on the table when you get your food. None are required, but one of the powders makes it spicy, the dark brown sauce makes it a bit sweeter, and the pickled vegetables will also make it a bit sweeter. I use a little sauce and about a jar of pickles. I have never really understood why curry has not caught on in the United States, where I am from. I cannot get enough of it here, and I worry that if I go home I might go into withdrawal symptoms and have to be rushed back for a quick bite. I am sure you have your own favorite combination of ingredients; why not let us know what it is by dropping a comment on the site? If you are not already familiar, here is a link to the English version of the menu they offer. Some stores will have it ready for you, but I suppose if you are worried you could print it out and bring it with you. One last factoid: The kanji in the name, ココ壱番屋 (CoCo Ichibanya), is exactly what it sounds like- Number 1. The kanji is a specialized and more formal version of the kanji for the number one that is used when writing contracts, etc. A friend described it as being similar to writing “ONE” instead of “1” in English, but I am sure it is somehow more complicated than that… kanji always is!